Considering it takes you from a handful of vertebrae to a feature-complete, all-dancing, fin-wielding life form, the creator is staggeringly simple to use. Your starting point is the spine, which can be pulled into various shapes, all of which affect how the finished creature will stand and get about. Around the spine is a blob of chewing gum flesh, which can be squeezed or inflated before the body parts are selected and applied, Mister Potato Head-style. And Mister Potato Head would be proud at the range available: there's a comprehensive selection covering everything from eyes and mouths to weapons and special details such as gills. Every part can be fiddled with - resized, angled, repositioned - and a paint menu allows you to colour in the creature's skin, or select from a range of pre-made designs. Forging the appearance of your creature is game enough in itself, but each addition is also shaping their attributes - altering a range of on-screen stats controlling everything from abilities and attacks to diet and socialising. From changing the body size using the scroll wheel, to dragging joints to stretch out the arms and legs, every tool in the Creature Creator works intuitively. The emphasis is on easy experimentation, and switching from Editor to Test Drive mode allows you quickly to see the creature in motion and demo everything from the way it walks and attacks to the sound of its mating call. The first time you click into Test Drive is a genuinely thrilling moment: your creature suddenly bursts into life in a way that manages to feel thoroughly unexpected but absolutely right at the same time. It's a combination of the animation (comic yet convincing, and filled with one-off touches: one of our creatures examined with interest the arm we'd just given it) colliding with the behaviour attributes born out of your design choices, but it's also much more than the sum of its parts. It's shocking how independent their behaviour seems - you may have prodded them together, but they emerge into Test Drive palpably powered by their own intelligence. It's also often slightly distressing to see the way your attributes have played out: if you haven't given your creature legs, it will wriggle about uncomfortably; if you've stretched its mouth to comical proportions, its voice will be weirdly distorted. Luckily, iteration in Spore is fast, and a single click can take you back to the editor to undo your damage. The quest for perfection quickly becomes all-consuming, and the ease with which you can start over - a creature can be built in well under a minute - means that you're driven to try again and again. Showing off the finished product is a typically polished process: snapshots can be emailed, film clips can be directly upload to YouTube, and - both blessing and curse - Spore can export creatures in the forms of animated .gif files, suggesting that Lolcats and headswaps of Shigeru Miyamoto may soon have a new enemy in the battle for message board mindshare. The game's wider presentation, however, is often less perfect. Clipping as limbs pass through snouts or eyes is an understandable, but fairly common distraction, and textures are often slightly slow in making the leap from one part of the editor to another. But details like this slightly miss the point. 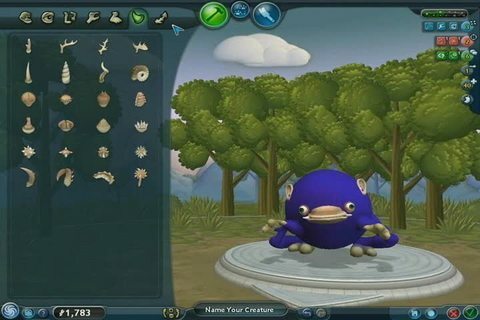 Like Spore itself, it's hard to describe the Creature Creator without simply reciting what you did with it, or devolving into a clinical list of its features, while the real breakthrough lies in the way these disparate and often complex elements fuse together to create something that seems coherent and simple. We can't tell whether the finished game will retain this careful balance when it's released in September. Evolution is, after all, something of a mixed bag. It's given us opposable thumbs and Bill Murray, but it's also prematurely killed off the McRib and allowed the word "chillax" to flourish. Luckily, Will Wright and his development team seem to be well aware of this, and if you're looking to Spore to deliver a first class bolt of genuine natural selection, you're probably being unrealistic. If this June's unique demo is anything to go by, Spore is Evolution Lite. This is no criticism - after all, a true evolution game would buckle under the amount of control Spore is already handing over to its audience. 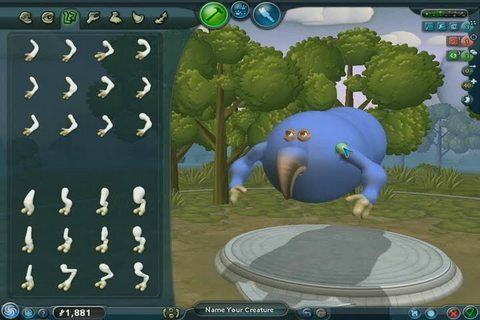 The Creature Creator suggests that Spore isn't going to be about sitting around waiting to mutate, it will be about getting stuck in and frantically experimenting. Over the past few years, gamers have grown used to getting chemistry sets for Christmas: Wright may be about to deliver chemistry, physics and biology, all rolled into one. Spore is due out on PC, Mac, DS and mobile on 5th September. The Creature Creator is due out on 17th June and will cost EUR 9.99 / USD 9.99 from Spore.com, and there's a free demo version too as noted above.